And you thought today's in-car devices were excessive. "In 1952, LIFE published an article about Louie Matter, a gearhead who tricked out his 1947 Cadillac with a shower (seen at right), drinking fountain, tape recorder, washing machine, stove, "and a bar with spigots for whisky, water and soda." 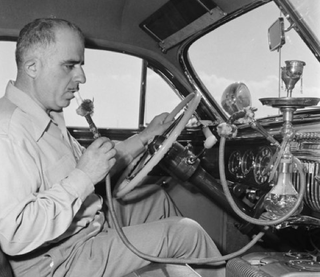 Oh yeah, and a dashboard hookah too. This, my friends, is the definition of "bow-tie classy.""